Here is a quiz. Let’s say someone says, “Sit,” to a dog, intending the word as a cue. What part of speech is the word, “Sit”? Then, what part of speech is the same word if we say, “Good sit!” afterwards? If we were talking to a human who speaks the same language we do, the first “Sit” could be an imperative or command verb. The second “Sit” would be a noun. But neither of those, while grammatically correct, applies to training a dog. Dogs are not humans. “Sit” is something else entirely to them. So if “Sit” is a discriminative stimulus, what is “Good sit”? I’ll get there. First I need to talk about this problem with words and meanings. We humans have an enormous problem to overcome when we use words as cues. When we hear the sounds that comprise the word “Sit,” in whatever language we speak, we can’t divorce the meaning of the word “Sit.” We generally pick verbal cues that are descriptions of the behaviors they apply to. Convenient for us, but unfortunate for the dogs. We can’t help but think they understand the cues as language. Sometimes we pick more colorful words for cues for our amusement or because the standard word is inconvenient. My friend Marge’s cue for her dog Zip to sit is, “Senta,” the Portuguese word for sit. “Sit” was too close to his name, plus she didn’t want to spend his life sputtering out, “Zip, sit!” And although he’s a Portuguese Water Dog, she didn’t pick “Senta” because he innately understood it. He doesn’t. She picked it because it’s fun, clear, and didn’t resemble any of her other cues. This inability to get the meanings of words out of our heads on behalf of our dogs is an intra-species example of the “curse of knowledge.” This refers to a situation where someone who knows something (in this case the human) can’t imagine not knowing it. Here is a link to a good synopsis of a famous study, “tappers and listeners,” about the curse of knowledge. In the tappers and listeners study, one person in a team of two would tap out the rhythm of a well-known song. The other person had to guess the song. The listeners could guess correctly only about 2.5% of the time. But get this: the tappers predicted that the listeners would know the answer 50% of the time. The tappers heard the song in their heads as they tapped, and couldn’t put themselves accurately in the place of the listeners, who were only hearing tapping. Even the most empathetic of us can’t turn off the songs in our own heads. 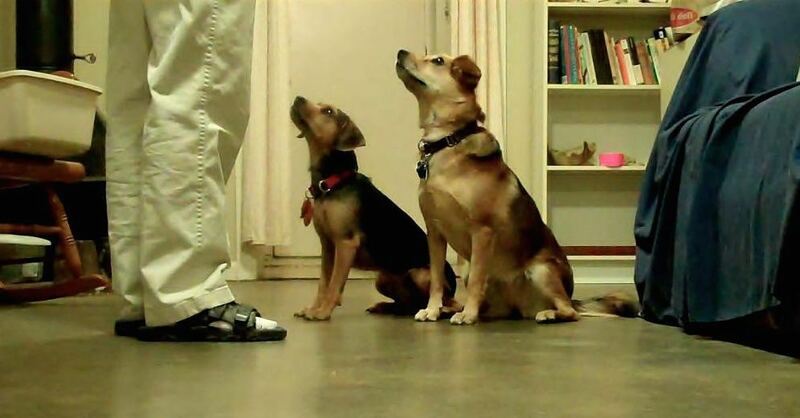 In dog training, we are the tappers and the dogs are the listeners. It’s worse though, because not only do they not know all these meanings and subtexts that are there for us, they are not capable of knowing most of them. Yet they read situations so well and are typically so attuned to us that they give the impression of knowing these things in the same way we know them. They have their own geniuses, but it is not likely that any dog understands language and grammar as we do. By the way, I am not the first to tell about the “tappers and listeners” study with regard to some characteristics of dog training. Kathy Sdao describes it and even demonstrates it in her DVD “What Not to Err.” My friend Marge incorporates it into her orientation for beginning clicker trainers. This assumes that the dog can follow the leap from “Sit” as a noise meaning that sit will be reinforced, to “Sit” as a noun, modified by “Good.” This makes no sense. It only makes sense in our twisted world where verbal cues unfortunately have meanings that correspond to the actions we attach to them. 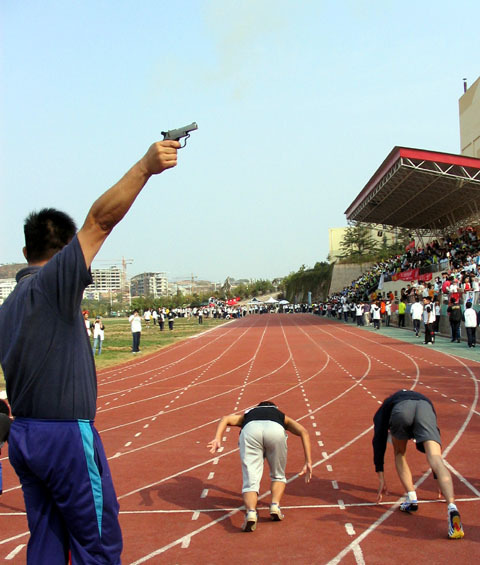 The starter’s pistol going off is a discriminative stimulus for people who run track. It indicates that pushing off the starting block and starting to run will likely be reinforced. So please envision this. A runner is practicing her starts. Today the coach is using a real starter’s pistol so she’ll get used to it. The coach fires the pistol, and the runner makes an excellent start. She runs a few yards, stops, and turns back. The coach says, “Good…” and BANG! fires the pistol in the air again. The runner startles and says, “Why did you fire again? I’m not ready! I’m not even in the block.” The coach says, “I was telling you that you made a good…” BANG! and fires the pistol one more time. With this example, we can clearly see that that the cue is not the same as the action. The coach means to tell the runner that she made a good start. **BANG** is not a description of the action of start. It’s just the cue that indicates a certain action will be reinforced. Likewise, “Sit” is the noise that indicates to a dog that sitting will be reinforced. It does not somehow “mean” that action to the dog. Frankly, I can keep this in my head only for short periods. It slides away so easily. Some might say, OK, it doesn’t mean what we think it does, but it doesn’t hurt anything to say it anyway. Well yes, there are worse things. But using, “Sit” as part of a praise phrase is not a desirable practice. First, you are repeating the cue when the dog is already doing the behavior. This dilutes the one-to-one pairing of the cue and the action, diminishing the power of the cue. It also adds more chatter to the training session, creating more verbiage for the dog to sift through to try to catch words that might be cues. Or to learn to ignore them. Finally, I believe we need to do everything possible to understand the dog’s point of view. Choose cues thoughtfully. Make sure they all sound different. Use them consistently, and only for that purpose. What if, instead of words in English (or your own native language), you had to use a randomly assigned color flash card or a complete nonsense phrase for every cue? Wouldn’t they be kind of hard to remember? That’s the position our dogs are in. They have to use brute memory on cues. That last reason is the big one. Saying, “Good sit!” every once in a while or even regularly does little harm to the dog in the grand scheme of things. I’m sure I do half a dozen things to my dogs that are more confusing than that. The harm is to us as trainers. It keeps us entrenched in the belief that dogs understand language the same way we do. If you are going to praise, far better to say, “Good!” or “Good girl!” or “Good dog!” And to say the same thing consistently. If you say it regularly before you give the treat, you are also building up a nice little conditioned reinforcer. But that’s a post for another day! License for starting line photo. Link to original starting line photo. I’ve heard people use “good sit” before, and wondered if it helped the dog understand what they did right, or if the dog would understand the word if it was repeated more often. I love the comparison about the tappers and the listeners. That’s really something to think about – I’ve often thought my dogs understood something, and have had a hard time empathizing with them when they just aren’t getting something. But as soon as I step back and look at the lesson from their point of view, it becomes easy to redesign a lesson so it makes sense to them. That was great, love the analogy. Thanks, I am going to remember that for my clients.